This weeks challenge is to make a mini book using Vinyl Sleeves and ISC Images....After I made my book, I went back to read the challenge - it called for ISC Holiday Images, it was late an no time to re-create my book - so here's my book using some NEW ISC Images. To begin, I adhered my Christmas of Magic DSP to my chipboard, then ran it through my Big Kick cutting it with my Top Note Die, leaving the left edge off. I stamped my image from Presence of Trees in Artichoke, as well as my sentiment from Be Thankful. 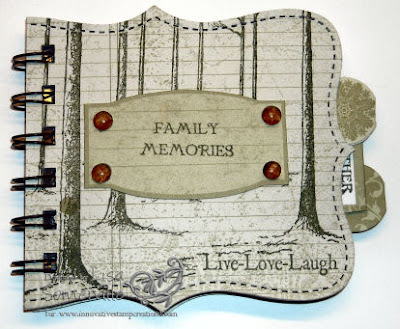 "Family Memories" also from the Be Thankful plate was stamped on a punch out from the Christmas of Magic DSP. I added some Dew Drops with Glossy Accents. The tabs on my inside pages are stamped with words from the Flair of Summer and Rustic Artsy Swirls. I used my Bind it All and 1/2" Chocolate Coils to bind my book together. Need to order some things from ISC? For one week only, starting 11/20 thru 11/27, you can SAVE 10% on your order from Innovative Stamp Creations - simply enter code lisas at checkout and save! Want to play along with ISCC19, and have a chance to WIN FREE product? Simply create your mini book, using ISC images only, and leave a link on the ISC Blog by 12/7, for your chance to win 1 Christmas Sheet of your choice and 1 set of the Vinyl mini sheets. Luv the book, luv the trees! WOW! this is awesome Lisa!! I also like this book. My daughter is working on her geneology. I may have to do something like this for her to post photos and information in. Wonderful project Lisa love the detailing on this would make such a nice memento from a special occassion. Great book Lisa! I love the colors of it. Woww, this is just fantastic !! Wow I love the look you achieved with the lines and the stamp. I have one started with top note die..now I better finish it.